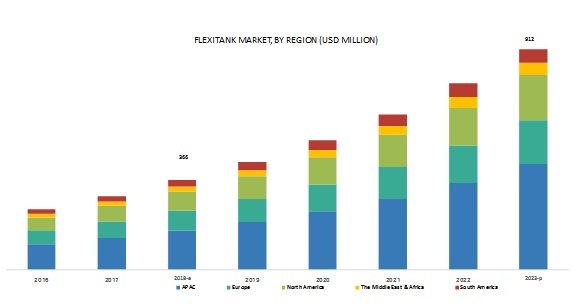 [108 Pages Report] The flexitank market size is estimated at USD 366 million in 2018 and is projected to reach USD 912 million by 2023, at a CAGR of 20.0%. Growth in the global trade of food-grade liquids, non-hazardous chemicals, and pharmaceutical liquids is the major driver for the flexitanks market. Also, its competitive benefits over other traditional substitutes drive the flexitank market. The multilayer segment dominates the flexitank market and is projected to be the fastest-growing type segment. The multilayer type segment accounted for the largest share and expected to register the highest CAGR during the forecast period. This segment has high-performance benefits over the monolayer segment. These benefits are its durability and strength which are highly required when flexitanks are transported throough old containers. Also, flexitanks have multiple layers which protect the cargo from getting contaminated. Its oxygen and moisture barrier properties are vital for the transportation of food-grade liquids. These benefits boost the flexitank market. The food-grade liquids application segment is projected to register the highest CAGR during the forecast period. Food grade liquids such as juice, juice concentrates, wine, animal oils, edible oils, glucose, glycerin, jam, malt extract, sauces, sorbitol, vinegar, water, and sugar syrup are traded in bulk quantities globally. These liquids are traded across all the regions. For example, edible oils and apple juice are exported majorly from the APAC region. Fruit juice, juice concentrate, and wine are exported from North America, South America, and Europe. Thus, flexitank finds global demand in the food-grade liquid application. APAC has the largest populous countries such as China and India. China, Japan, South Korea, Indonesia, Malaysia, and India are the major consumer markets for flexitanks. China, Hong Kong, Australia, Singapore, and New Zealand are among the top 15 exporters of wine. The presence of this huge wine exporting industry across the region is favorable for the demand for flexitanks. Also, in palm oil exports, Indonesia, Malaysia, and Thailand lead the market with largest exports. Indonesia and Malaysia are the 1st- and 2nd-largest palm oil exporting countries across the globe. 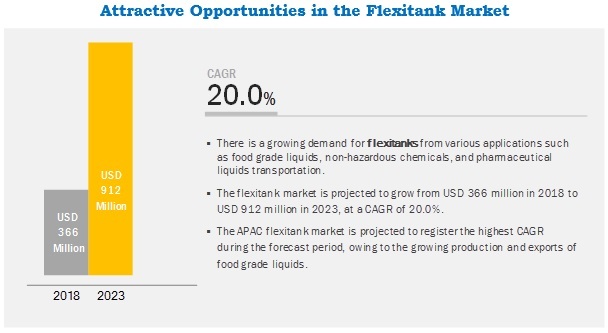 Across APAC, the majority of the flexitank demand is driven by food-grade liquids exports. Braid Logistics (Scotland), Bulk Liquid Solutions (India), Environmental Packaging Technologies (US), SIA Flexitanks (Ireland), and Trans Ocean Bulk Logistics (US) are the key players operating in the flexitank market. These companies have adopted various organic as well as inorganic growth strategies between 2015 and 2018 to strengthen their position in the market. New product launch and expansion were among the key growth strategies adopted by these leading players to enhance their product offering and regional presence and meet the growing demand for flexitanks from emerging economies. In October 2018, Braid Logistics expanded its global network in APAC with the establishment of Braid Japan Co., Ltd. (Japan). This expansion will allow the company to cater to the Japanese export market and expand its footprints across the APAC market. In November 2016, Braid Logistics innovated Braid Agi-tank, which is ideal for liquids with high solid contents such as pepper mesh, fruit pulp, grape mash, olives, and fish slurries. This newly launched flexitank has more than two injection points, which can be used to pneumatically mix high solid content liquids before discharge. These liquids can be pepper mesh, fruit pulp, grape mash, olives, fish slurries, and many other liquids. In June 2017, Environmental Packaging Technologies (EPT) launched a new flexitank under brand name LIQUIRIDE, especially for refrigerated shipping containers. The company will benefit from this new line of flexitanks, which focuses on applications requiring temperature-control transportation of fresh juices and concentrates. In June 2017, Environmental Packaging Technologies (EPT) doubled its production capacity of flexitanks at its Michigan, US plant. This development is in response to the increasing demand for flexitanks. What are the upcoming hot bets for the flexitank market? How is the market dynamics changing for different types of flexitanks? How is the market dynamics changing for a different application of flexitanks? Who are the major manufacturers of flexitanks? How is the market dynamics changing for different regions of flexitanks? The study involved four major activities in estimating the current market size for flexitanks. The exhaustive secondary research was conducted to collect information on the market, peer market, and parent market. The next step was to validate these findings, assumptions, and sizing with industry experts across the value chain through primary research. Both top-down and bottom-up approaches were employed to estimate the complete market size. After that, the market breakdown and data triangulation methodologies were used to estimate the market size of segments and subsegments. The flexitank market comprises several stakeholders such as raw material suppliers, distributors of flexitanks, , end-product manufacturers, and regulatory organizations in the supply chain. The demand side of this market consists of manufacturers and suppliers of food-grade liquids, pharmaceutical liquids, and chemicals. Various primary sources from both the supply and demand sides of the market were interviewed to obtain qualitative and quantitative information. Following is the breakdown of primary respondents. After arriving at the overall market size using the market size estimation process explained above the market was split into several segments and subsegments. In order to complete the overall market engineering process and arrive at the exact statistics of each market segment and subsegment, the data triangulation and market breakdown procedures were employed, wherever applicable. The data was triangulated by studying various factors and trends from both demand and supply of flexitanks and their applications. Notes: Micromarkets1 are the subsegments of the flexitank market included in the report. This research report categorizes the flexitanks market based on type, loading type, application, and region. The flexitanks market has been further analyzed based on key countries in each of these regions.